Lowdown: Two middle aged women develop romantic relationships with their each other's sons. There are numerous things about Adore that are worth praising even before one gets to watch this movie. For a start, it is a very female led movie – as female led as a movie can be, probably. It sports a female director (Anne Fontaine) and features two leading female actresses as its two leads (Robin Wright and Naomi Watts). But wait, there’s more: Adore is set in Australia; it was shot in Australia (NSW’s Seal Rocks is the movie's most notable feature); and its heroines are all meant to be Aussies. The movie itself isn’t bad, either, offering fine drama and excellent acting. The two leads are two best childhood friends who grew up together by a Garden of Eden grade beach and constantly lived in each other’s company over the years. Now, as mature women with kids of their own, one loses her husband to become a widow while the other loses her husband (Ben Mendelsohn) to a job opportunity in Sydney. You see, no sane person wants to leave the heaven they have for anything else. Not even the kids. When they become mature enough for a relationship, they do not go astray; they stick to what they know. And what they know are the two women that have been there their entire lives. Romantic relationships develop, with all the complications one would/could expect to drive the dramatic story that is Adore. It’s a fine story, but the main event here is the way the story is told – as I said, it’s a fine actors’ drama. In many respects, including its pacing, Adore feels like a play. If one seeks to find messages here, then perhaps these are to do with our fear of the strange[r] or our built in reluctance to change when we think we have a been dealt good cards. You can thus argue Adore is an anti conservatism movie, but I think that would be stretching things too much. Naomi Watts stairs at the mirror closely, examining the signs of her middle age appearance (given her much younger lover). I know, there was probably lots of makeup involved with the making of this scene and Watts' own features have little to do with what Adore shows us, but it is still rare for a female star to expose herself to an audience this way. The male equivalent is the much less interesting male hero examining his battle scars, and the analogy is interesting: do women's battle scar come purely as the result of ageing? For what it’s worth, Wright has a similar scene, although she is not alone in hers. 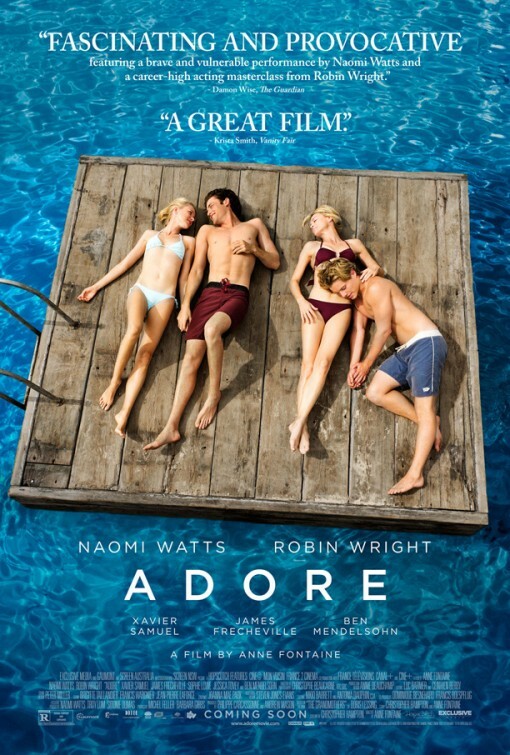 Overall: Adore is worth adoring for many a good reason. 3.5 out of 5 crabs.